Gypsy Paws offers several indoor and outdoor areas for play, rest and loving attention from attendants who are present and engaging with the pooches at all times. Your beloved pup will go home happy and calm; no longer will you have to worry about chewed furniture, shoes or accidents! and boarding with unconditional love! 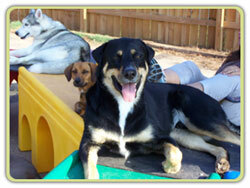 Gypsy Paws is a doggie daycare and non-traditional boarding facility that promotes happy healthy dogs. Gypsy Paws is different from old fashion boarding facilities; no longer will your dog come home stressed, under-exercised and anxious. While at Gypsy Paws for day-play or sleepovers, your pup gets to meet new friends, run, jump, play and enjoy a good story at nap time. The main gathering room has comfy crates, fresh linens, privacy curtains and turndown service all for only $25 a night for the first dog and $20 a night for each additional dog*. The Mid Run Rooms have comfy beds and large, private quarters with turn-down service for only $30 a night for the first dog and $20 a night for each additional dog*. The Private Luxury Rooms are furnished with comfy chairs, fluffy linens and cable TV all for only $40 a night for the first dog and $20 a night for each additional dog*. 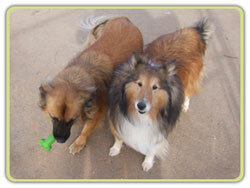 With highly experienced groomers we can give your pooch a fresh new scent on life! * All pooches must be 4 months of age. 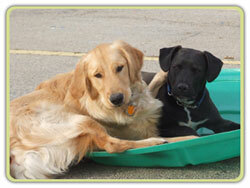 All pooches must be spayed or neutered by 6 months of age. All pooches must have proof of current shots and have had Kennel cough vaccine in the last 6 months. Rates are accurate at the time of printing and are subject to change. Please call for reservations and to confirm pricing.